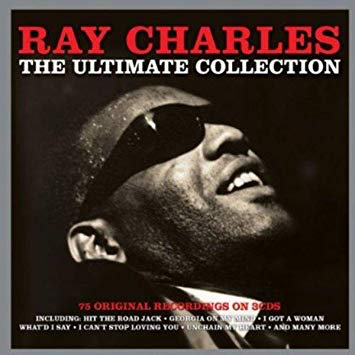 This is a wonderful collection of seventy-five Ray Charles tracks, covering his superb Atlantic soul material, blues stuff, jazz, country standards given his unique treatment, easy-listening crooners and even some rock'n'roll-ish numbers. Yes, there are a few cheesy ones here and there, but by and large you can dip into this compilation at any point and enjoy it, or better still, put it on random. The sound quality is absolutely stunning - excellent stereo in many cases and a big, booming mono as well. Either sound great. Initially I worried that the sound on here might not be so good. I was wrong, it is most impressive. The highlights are the obvious ones - "Hit The Road Jack"; "Georgia On My Mind"; "What'd I Say"; "I Got A Woman"; "I Can't Stop Loving You"; "C.C. Rider" and "Unchain My Heart". There are many gems to found all over the album, though, Charles is just so good. Check out something like "Leave My Woman Alone". It is rocking, soulful and bluesy all at once. Then there is the big, brassy jazz of "Let The Good Times Roll". The blues of "At The Club" carries one huge bassy thump making your speakers shake. On "Hallelujah I Love Her So" you get a rock 'n' roll jazzy groove that instantly lifts your spirits. There are too many tracks to list them, or comment on each of them, as I do on my usual individual album reviews but I can heartily recommend this collection, as, I am sure, would Van Morrison.